Spider spirit animal symbolizes creativity, storytelling, spirals, and inner divine union. Spider is a master storyteller and creative force. You can weave a story, get stuck in it, and find your home covered in old cobwebs. It’s time to clean up your perspective. Sweep and burn away the stories that clutter your mind and space. Instead of getting tangled up in ideas, focus on your creative energy to write a new story for yourself. You are the weaver of your life and dreams. Spider is patient. It spins a web from inspiration then waits for nourishment to come to it and only takes action once it’s approached in its web of alignment. No need to force, push, scheme, or hunt. Set your web of intention and feed on it. Just as Spider feels the vibrations of movement through each strand of its web, you’ll feel the intuitive call to action when something is truly aligning. 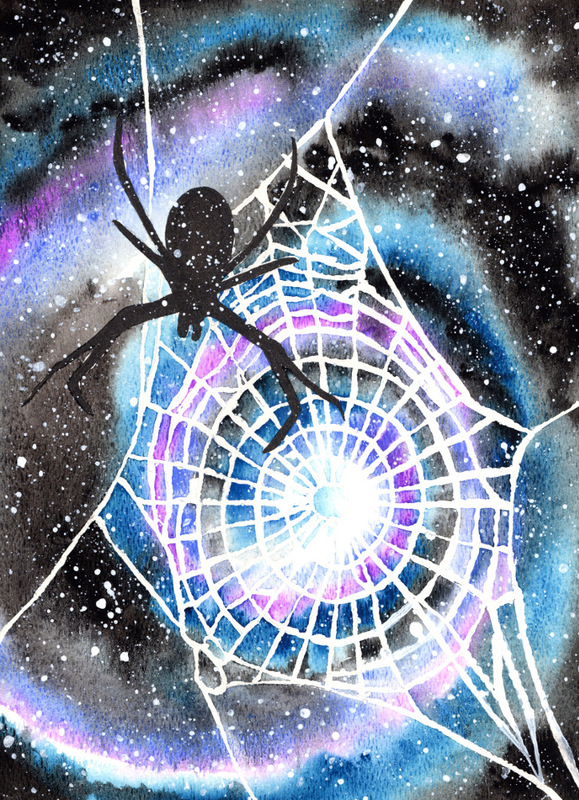 Spider is very connected to spiral energy and uses this pattern in the construction of its web. Use the power of the spiral to journey deep into your shadows to bring wisdom into your life as you spiral in and out. The more willing and less resistant you are to feel the pain of your shadows the quicker you’ll be able to go in and out of this natural spiral process, which will continue to happen for you throughout life. You can’t avoid the spiral transformation that you’re on, so embrace it. Also, notice that as you go around the spiral that you gain a new and greater perspective than you did the 1st time you went around the center point. You’re ever expanding. Animal Shaman Ted Andrews notes that “Spiders’ two-part abdomen (different from insects) forms the shape of infinity, this aspect, paired with Spiders‘ eight legs, gives the number 8 significance for anyone with a Spider appearing as their totem. In numerology, the number 8 is shaped like an infinity sign and represents balance and power”. Most specifically the balance of masculine and feminine energies within you. People who fear spiders, actually fear to look at the balance of the divine union within themselves as well as the false stories they’ve created for themselves and the responsibility to be able to write a new story. Invite Spider into your life. Surround, inspire, and remind yourself that your spirit animal guide is with you & within you. Embody the skills of your power animal and share your unique gifts with the world. Browse through my collection of paintings, art prints, and cards or request your own custom painting. I would love to paint your spirit animal for you. What animal is calling to you? 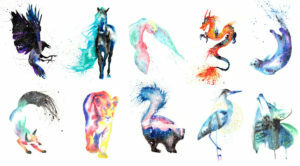 Reconnect to yourself and the wild world through the guidance of the Spirit Animal World tarot card deck. I want to hear about your Spider experiences. What stories or dreams have you had? Please share and join in the conversation below!